Kozenji Temple (興禅寺) Zen temple located in Kiso, Nagano prefecture. It is one of three major temple in Kiso. There are 4 beautiful Japanese gardens including the largest sand garden in Japan. Kozenji was established in 1434 by Kiso Nobumichi. Also, this is known as the temple of Kiso Yoshinaka. There is a grave of Yoshinaka. Admission: 500 yen for adult, 300 yen for kids. 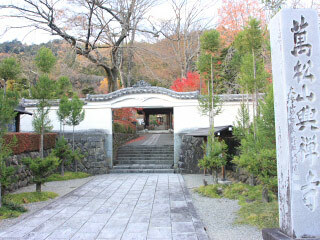 Kozenji is Rinzai Buddhism Myoshinji temple. It is the temple for Kiso clan, and Yamakura clan. It was established in 1434 by 12th Kiso Lord Nobumichi for his great ancestor Kiso Yoshinaka. Kiso Yoshinaka is one of the Hero during Genpei War. There are four beautiful Japanese gardens in Kozenji and treasure museum. It represents the legend of the birthplace of Dragon. In China, there is waterfall that when fish swim upward the fall, that fish becomes dragon. There is a gate of rising dragon in this garden. Nine mountains and 8 seas. It represents the universe. Built in middle of Edo period. It is a garden with a pond and waterfalls. It was designed by Morimie Shige. He was the best garden designer in Showa Era. It is view from high mountain. White line represents the cloud. The rocks represent mountains. These rocks were crystalline schist formed under sea. The white sands are from Shirakawa sand of Hieizan. Just like the clouds of Kiso, drawing on the sands is different everyday. There is also garden with pond. Please compare the difference. Mr. Morimie was known as very modern artist. There are many books still publishing even after his death. He is the world famous garden designer. This space is also used for an art gallery or display space. Sometimes, we set a stage and hold a concert. Sweeping Sakura that blooms in the end of April is another main feature of Kozenji. Yoshinaka Museum is the story taller of Hero Kiso Yoshinaka. Minamoto no Yoshinaka, also known as Kiso Yoshinaka is one of famous Shogun and war hero during Genpei War. Under the order of Mochihito King, Yoshinaka raised his army to defeat Heike. He defeated many armies of Heike and entered Kyoto. He became Asahi Shogun. However, because he never stayed and experienced Kyoto, he failed to rule Kyoto. Later, at Awatsugahara, he was defeated by Yoshitsune and died. He was in 31 years old.